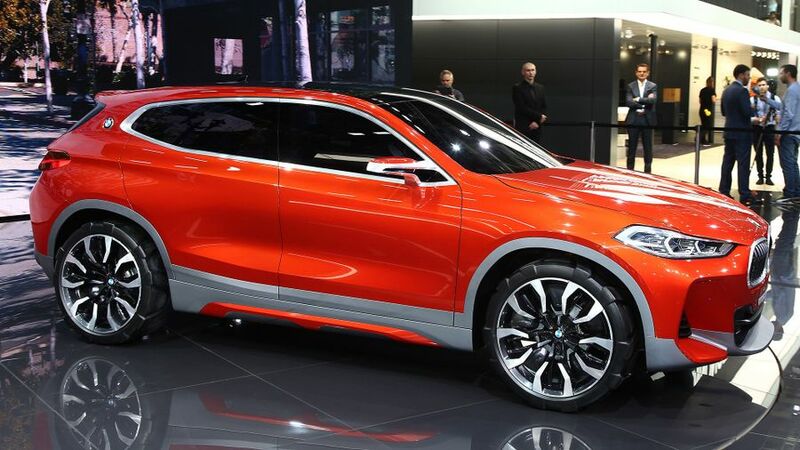 BMW has revealed its Concept X2 at the Paris Motor Show. A smaller, sleeker SUV with a coupe profile, the X2 is essentially a sportier take on the more practical X1, rather than a direct rival for Audi's mini SUV, the Q2. The concept certainly packs a visual punch, but the production version of this new SUV is still some way off, with a planned on sale date pencilled in for autumn 2018, with prices likely to start at around £30,000, above the X1. The five-door SUV coupe, is the sixth dedicated SUV model in the company’s line-up. The large double kidney grille, slim headlights, big front bumper, silver lower trim, and wide wheelarches all give the X2 a rugged SUV look, but it’s got that low roof line that gives it the coupe profile - expect almost all these visual cues to appear on the finished version. This is still technically a concept though, so not all the design aspects are likely to remain for the production model (we would strongly wager that huge 21-inch wheels will be shrunk by an inch or two). Inside, it’s likely to have a cabin layout similar to the X1, and it’s likely to have a similar engine line-up too. Buyers will have the option between a six-speed manual and eight-speed automatic gearbox, and the choice of rear- or front-wheel drive. Underneath the X2 is going to use the same chassis platform as the next Mini Countryman, which will both have similar exterior dimensions to the X1, but the feeling of space inside is likely to be reduced by the steeply raked roofline, at least for those sat in the back, still it's a formula that certainly hasn't done the Range Rover Evoque any harm. More technical and specification details will be released closer to the launch (which is still more than a year away).